We've got some exciting news! Our restoration work in North Bondi has worked and we've just seen our first new craybies!!! Here's some photos of the next generation of crayweed - we are truly over the moon. Marine scientists from UNSW Sydney and the Sydney Institute of Marine Science (SIMS) have won the NSW Government’s Natural Environment Award for an innovative project to restore crayweed forests to Sydney’s foreshores. 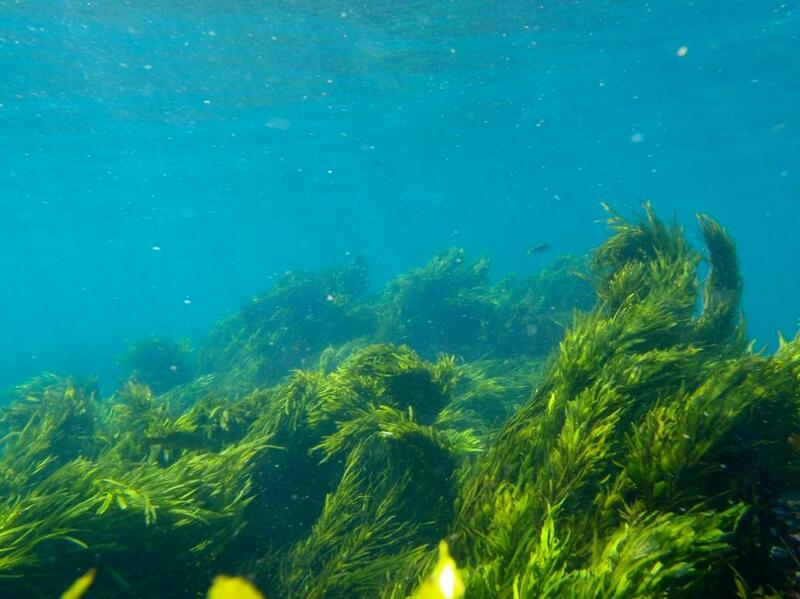 Crayweed forms underwater forests that support unique ecological communities of fish and invertebrates. Photo: John Turner. The award, part of the 2017 Green Globe Awards recognising people and organisations committed to environmental sustainability, went to Operation Crayweed, a team of scientists which includes SIMS Director and Professor in the UNSW School of Biological, Earth and Environmental Sciences, Peter Steinberg, and his colleagues in the School, Dr Adriana Vergés, Dr Ezequiel Marzinelli and Dr Alexandra Campbell. Dr Melinda Coleman from the NSW Department of Primary Industries and Associate Professor Brendan Kelaher from Southern Cross University are also part of the winning team. A big brown seaweed, crayweed forms underwater forests that support unique ecological communities of fish and invertebrates, including lobster and abalone fisheries. Once dominant along Sydney’s coastline, crayweed started to disappear mysteriously about 30 years ago. The Operation Crayweed team combined cutting-edge ecological research, citizen science, community engagement and art to raise awareness about the importance of these underwater seaweed forests. Team members demonstrated the environmental and ecological benefits of restoring Sydney's coastal crayweed forests and, by working with the public, put the marine restoration project into action. 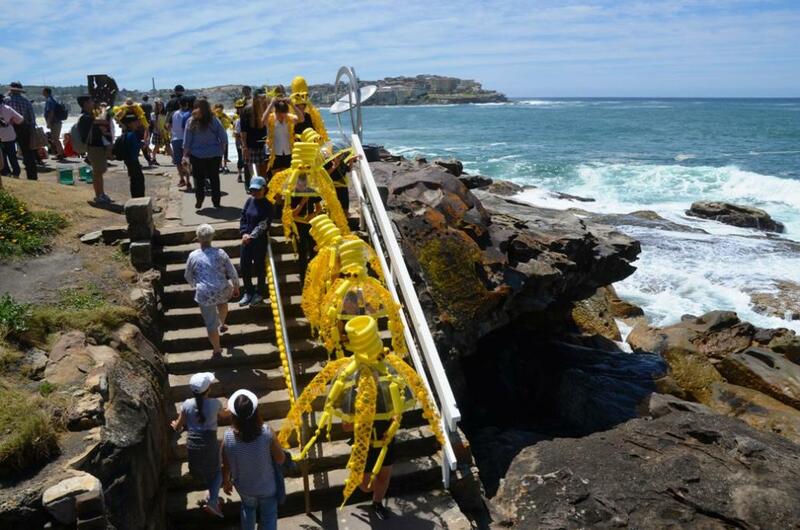 Recreational divers, a crowdfunding campaign, a website and film, extensive media, art installations at Sculpture by the Sea, and more than a hundred school children all contributed to the project. Dr Adriana Verges (left) and artist Jennifer Turpin at the 2016 Sculpture by the Sea art installation at Bondi. By championing marine restoration together with seaweed-focused outreach, the team has reversed the local extinction of crayweed along the Sydney coastline, said the award citation. Operation Crayweed was also a finalist for the 2017 Australian Museum Eureka Prize for Environmental Research. An independent panel of sustainability experts selected this year’s winners of 12 Green Globe Awards, which were presented on Thursday at the Art Gallery of NSW hosted by NSW Environment Minister Gabrielle Upton. Office of Environment and Heritage Chief Executive Anthony Lean said the varied projects were helping ensure NSW built the most sustainable future possible. “I’m inspired by the pioneering projects and the dedicated people and organisations across our state who are committed to driving us towards a better future for our planet and the next generation,” Mr Lean said. A diverse range of innovative projects from across the state have been highlighted in this year’s winning line-up for the Green Globe Awards. Office of Environment and Heritage Chief Executive Anthony Lean said the varied projects are helping ensure NSW builds the most sustainable future possible. “I’m inspired by the pioneering projects and the dedicated people and organisations across our state who are committed to driving us towards a better future for our planet and the next generation, Mr Lean said. Stone and Wood Brewing Co based in Byron Bay scooped both the Business Leadership Award and the prestigious Premier’s Award for Environmental Excellence this year. “Stone and Wood has built sustainability into their core operations from the ground up,” he said. “They’re not only producing beer in the most sustainable way but they’re also raising awareness and educating others in their sector about what’s achievable. “The team from Stone and Wood also works within their local community on environmental, economic and social sustainability issues,” he said. The Sustainability Champion Award went to Alexandra Iljadica for her Youth Food Movement initiative which is connecting and equipping young people with the skills needed to address pressing food environment challenges. “Alexandra’s story is one of outstanding leadership in setting up an organisation from scratch and mobilising a vibrant network of skills-sharing and collaboration, creating Australia’s only youth-led food organisation,” Mr Lean said. Australia’s first community owned renewable energy retailer Enova Community Energy received the Regional Sustainability Award, while 24-year-old Anna Jane Linke is 2017’s Young Sustainability Champion. “Both are very deserving winners and are a credit to their communities,” he said. “Anna Jane is the leader of her very own coastal rubbish revolution, filling a gap with her Seaside Scavenge initiative. “She’s making a real difference reducing coastal waste and pollution while changing behaviour through practical environmental solutions. “Enova Community Energy is also breaking new ground with its inspiring business model which is maximising local job creation and recycling 50 per cent of its profits back into the community,” Mr Lean said. An independent panel of sustainability experts selected this year’s winners who were presented last night at an event at the Art Gallery of NSW. NSW Environment Minister Gabrielle Upton hosted the Awards and the Master of Ceremonies was sustainability champion and award-winning journalist Indira Naidoo. For further details about all the winners, the projects and their locations please visit: Green Globe Awards. Organisations who help to preserve the natural world around us. This award recognises leadership in protecting and enhancing natural ecosystems, including native plants and animals, threatened species, natural habitats, forests, water resources, land systems and soils, and biodiversity. It was once dominant along Sydney Sydney’s coastline. Then around 30 years ago it mysteriously disappeared. It was crayweed, a big brown seaweed forming underwater forests that supported a unique ecological community of fish and invertebrates, including highly valued lobster and abalone fisheries. In an innovative project to restore the species to Sydney’s foreshores led by the Sydney Institute of Marine Science, the Operation Crayweed team has combined cutting-edge ecological research, citizen science, community engagement and art to raise awareness about the importance of underwater seaweed forests. Recreational divers, a crowdfunding campaign, a website and film, extensive media, art installations at Sculpture by the Sea, and more than a hundred school children have all contributed to the project. By championing marine restoration together with seaweed-focused outreach, the team has reversed the local extinction of crayweed along the Sydney coastline. The project has significantly increased public awareness of global marine habitat degradation, and demonstrated the positive role of science and community engagement in a species recovery. Please come and have an enjoyable and informative experience. The SIMS Discovery Centre at Chowder Bay is open from 10.00 am to 2.00 pm on the second Sunday in every month. Members of Sydney Cove Rotary help in welcoming the visitors and connecting more people with the SIMS community. Contact SIMS for details as to the next general opening of the Discovery Centre . Or if you have a large group, why not book an organised tour. The historic sandstone mine labs at the foreshore of Chowder Bay are the perfect backdrop for the new SIMS Discovery Centre, which has been more than a year in the making! The two historic rooms have been fitted out with a series of beautiful displays that showcase what SIMS is all about – research of the marine, coastal and estuarine environment. The impacts of human activities on our coasts and oceans are at the heart of much of SIMS’ research and the new centre. The entry room is a celebration of Port Jackson i.e. Sydney Harbour showcasing the wonderful diversity of marine life, habitats and ecosystems we have at our doorstep. Rocky reefs, above and below the water, are particularly featured. Highlights of this exhibit are a 3-d model of the harbour, which shows the harbour’s complex shape and topography of the seafloor, and a virtual dive using 3-d virtual reality goggles. The virtual dive has been designed specifically for SIMS and aims to immerse visitors into the magical world of a local kelp forest, the most prominent ecosystem on our temperate rocky shores. Reactions of visitors so far have been overwhelmingly positive with comments such as “I don’t want to stop!” and “This is amazing!”. “Leaving the harbour” – the second room leads visitors onto the open coast. The main themes explored here are the East Australian Current, the main boundary current along the east coast of Australia, and the impacts of climate change on this current system and coastal ecosystems. Exhibits in this room tell the story of individual scientists and their research projects. Gorgeously designed digital displays invite visitors to explore the stories behind the research and learn about topics such as coastal erosion, coral bleaching, toxic algal blooms and eddies to name just a few. Scientists of the NSW Department of Primary Industries have also contributed to the display with a series of fascinating stories on the management of fisheries in a changing climate. SIMS is very excited to be able to welcome visitors to its new centre, which offers something to everyone; physical models to touch, colourful images to enjoy, a virtual dive and modern touch screens to delve deeper into the research presented. We are looking forward to seeing you in the centre soon!